The Yorkie-Apso is a designer breed that is made up of a Yorkshire Terrier and a Lhasa Apso. This breed originated in the United States. The Yorkie-Apso may reach heights between 8-11 inches and can weigh between 7-15 lbs. Please note, however, that since this is a mixed breed, there is no set guideline for the height and weight. The coat for the Yorkie-Apso is usually long and silky. However, as with any designer breed, the puppy can take on the characteristics of either breed that make up the mix. Yorkie-Apso dogs are generally very calm, loyal and hardy dogs. However, the best way to determine the character possibilities is to look at the character of the breeds that make up the mix and understand that you can get a mix of any of the characteristics of either breed. Yorkie-Apso dogs are generally very calm, loyal and hardy dogs. However, the best way to determine the character possibilities is to look at the character of the breeds that make up the mix and understand that you can get a mix of any of the characteristics of either breed. The Yorkie-Apso is eager to please and is generally a happy little dog who prefers the company of its owner. However, the best way to determine the temperament possibilities is to look at the temperament of the breeds that make up the mix and understand that you can get a mix of any of the characteristics of either breed. You can find Yorkshire Apso puppies priced from $800 USD to $3600 USD with one of our credible breeders. Browse through our breeder's listings and find your perfect puppy at the perfect price. The Yorkie-Apso is eager to please and is generally a happy little dog who prefers the company of its owner. However, the best way to determine the temperament possibilities is to look at the temperament of the breeds that make up the mix and understand that you can get a mix of any of the characteristics of either breed. The Yorkie-Apso should be brushed regularly. Their coat will usually be medium to long in-length. The Yorkie-Apso breed is eager to please and requires a consistent, firm but gentle trainer. The Yorkie-Apso does not require vigorous exercise but will enjoy a daily walk with their owner and regular playtime. Yorkshire Apso Puppies for Sale - Shipped Worldwide! Finding the right Yorkshire Apso puppy can be dog gone hard work. PuppyFind® provides a convenient and efficient means of selecting and purchasing the perfect Yorkshire Apso puppy (or Yorkshire Apso puppies) from the comfort of your home, 24 hours a day, 7 days a week. Take advantage of our PuppySearch or leisurely browse our directory of hundreds of dog breeds, Yorkshire Apso dog breeders, Yorkshire Apso dogs for adoption, and Yorkshire Apso puppy for sale listings with photos and detailed descriptions. 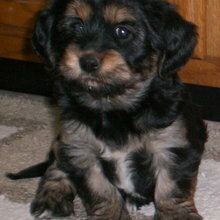 Some Yorkshire Apso puppies for sale may be shipped Worldwide and include crate and veterinarian checkup. Many Yorkshire Apso dog breeders with puppies for sale also offer a health guarantee. With thousands of Yorkshire Apso puppies for sale and hundreds of Yorkshire Apso dog breeders, you're sure to find the perfect Yorkshire Apso puppy.